When I was a kid I LOVED money. My mom says my first word was “Penny” and I was always enamoured by it. When I played Robin Hood I always wanted to be the Sheriff of Nottingham and I’d tax collect from all my stuffed animals. I’d then sit for hours rolling coins that my Papa brought me, for a cut of course. When I was 14 I had mutual funds that I tracked meticulously on my Mac computer. I was trading options and stocks all through University to pay for my education and my first loft when I graduated. My parents worked really hard just like other kids’ parents but I noticed that some kids’ parents had newer cars or bigger houses. My little mind always wondered how people ended up with new or bigger stuff than other people. I never went without anything and was ridiculously spoiled but I wanted to live the dream on TV. Ritchie Rich styles and money was the common denominator. Our financial planner had a Mercedes and it was AWESOME. These are the lessons I learned to make me a money champ! 1. Keeping Money is as Rewarding as Spending it. When I was 9 or 10 I use to keep all of my money in a brief case in my closet because I didn’t want it so far away in a bank. I used to count it and pack it neatly with elastic bands around it. When I wanted to buy something like a hamster I weighed the idea of losing some of my money vs. the joy of getting “Spazy” my hamster. I decided to wait until I made the $50 in birthday money before I got the hamster. The joy of having a whack of money in my closet was more than buying stuff. 2. Money makes Money. I started to invest when I was really young. I researched all the different funds and would read up on what area was growing and what countries had the greatest growth rates. The money I invested made more money and I didn’t have to do anything! I invested and then actively managed my small amount of money to make sure it grew. I would actively switch funds to always get the best return and added my Camp Councillor pay to it to make it grow even faster. 3. Money Mentor. My great-uncle had sold his business and had a broker to manage his money. Before I could drive I’d get my dad to drop me off at his house and we’d go through his investments and holdings. I thought it was so cool that you cold buy stocks and they’d pay money into your account every few months with something called “dividends”. My great-uncle loved that I was into money and would take me to meet with his broker. We’d sit in the fancy meeting rooms of the brokerage and talk about how I could become a broker one day. Once I could drive of course! 4. Take Your Kids to the Bank. My parents were super smart to take me to our Financial Planner when I was super young. He had a big desk, was dressed to the “9s” and always had awesome cars. I wanted to be him. Money that my Grandma and Grandpa had given to my brother and I needed to be invested and he sat down with us and explained how to start investing and principles of the market. The bank wasn’t a weird place but a place that I understood what went on there. 5. Watch your Cash Flow. When I was four or five I found a gold clutch with shiny tassels that my Nana used to use when she’d hit up big band concerts with my Papa in the 1940’s. I LOVED it and she let me use it as my first wallet. We’d go to the bank and I’d fill it with deposit slips and Nana would give me one of our old $2 bills so I’d have money in it. I grew up to love going to the bank and tracking my cash flow. I would check my transactions and make sure that money was always going in more than it was going out. I started using a computer money tracking system once they came out so I could chart my mutual funds and income from my part time jobs before University. Watching my money from the get go taught me how to budget and always have more coming in than going out. Those five lessons made me a personal finance expert and provided the foundation for an awesome life. Money is a fuel for all the things that you want to be do in life and being smart with it makes things easier. 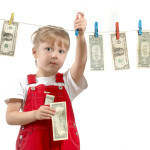 Get your kids to understand and love money as soon as you can. Hard work and mastering money will take them the distance.